We will all face something today or tomorrow, next week or year or decade, that simply feels like it’s too much for us. When this happens to me I tend to eat chocolate in the pantry alone while I come up with a brilliant plan for how to make everything better. Yes, I’m just that spiritual. In the past the strategy I’ve usually decided on can be summed up in six words: be good, do more, try harder. I convince myself that if I’m perfect and hustle enough and make things happen then somehow it will all turn out okay. I went to sleep last night thinking this way. Sometime past midnight I woke up in the dark and these words came to my heart: “Not by might nor by my power but by my Spirit” (Zech. 4:6). Another translation says it this way, “You will not succeed by your own strength or by your own power. The power will come from my Spirit” (ICB). When I looked up the verse this morning I noticed it ends this way: “says the Lord of heaven’s armies.” I’d been worried because I thought the battle was completely up to me. And all the while I had the Lord of heaven’s armies willing to fight on my behalf. I don’t know what you’re facing right now. But I do know this: You don’t have to overcome it alone. The outcome doesn’t rest on our smarts or our strengths or even our circumstances. Our victory isn’t dependent on our virtue. It’s just really not about us at all. It’s hard to have a bigger perspective when you’re eating chocolate by yourself in the pantry. But I see what I’m facing in a different way now. I am a beloved daughter of God. I am more than a conqueror. 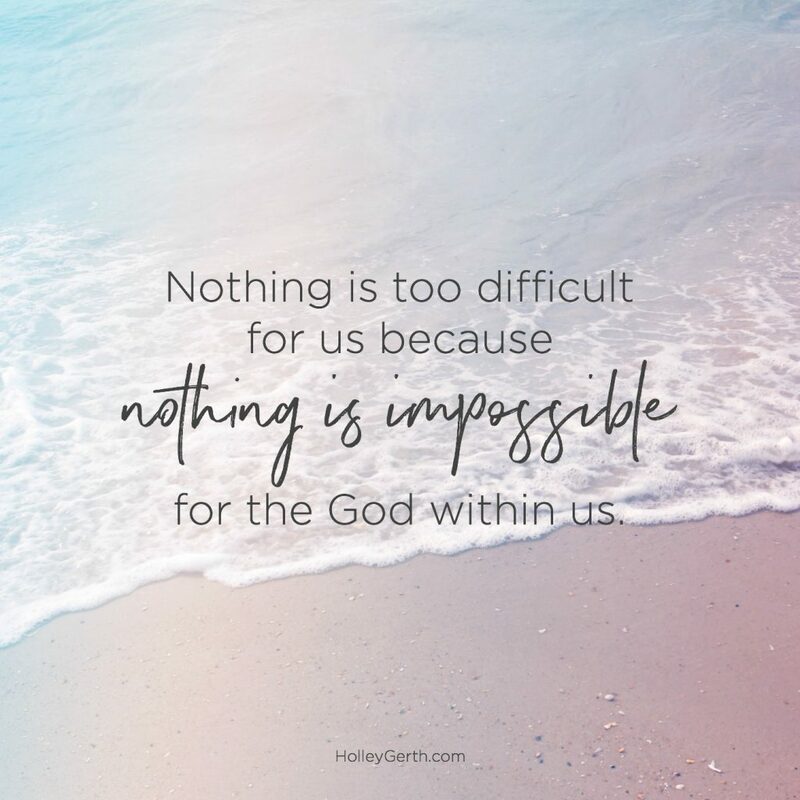 Nothing is too difficult for me because nothing is impossible for the God within me. He will do it. The same is true for whatever you’re facing too. God, we come to You with whatever we’re going through today. We thank You that we don’t have to face it alone. You are with us and for us. You surround us with Your love. You will take care of us. You will complete Your plans and purposes in our lives and in the lives of those we love. We choose not to rely on our strength or our own power but on Your Spirit. Amen. P.S. If you like this post you might love You’re Going to Be Okay. Here’s a free chapter. I love this reminder! Remembering who is in us is key! Recently, the verse God kept bringing to mind was a fragment of Psalm 46: “The Lord of Hosts is with us. The God of Jacob is our Refuge.” And I think The Message renders Lord of Hosts and God of the Angel Armies! I love that image! So, eating chocolate in the pantry is a BAD thing??? 🙂 I love the line in your post ” It’s just really not about us at all”. We tend to think that everything is about us. Thanks for the reminder that this is just not true. Dark chocolate calls me when I’m stressed too. And the Lord has used Zech. 4:6 to get my eyes off of myself. I like the explanation that He is the God of Angel Armies. What an awesome picture! Just what I needed, Thanks, Holley. It always Him and not me. Truffles, anyone? Holley: God makes no mistakes and I thank him daily as I know, “this too shall pass! !” I am dealing with the loss of my father, a job that is determined to fire me, and just wanting/needing better. Your message is right on time, as that is how God works!! I remind myself of what they did to Jesus so who am I? Please continue to allow God to use you, you are definitely a blessing!! So sorry for the loss of your beloved father. I pray God will sustain you & bring about peace & comfort to your soul! Dealing with parents health issues is never easy. I went through some aging parent health issues & a job that wanted to fire me. I was blessed to be able to quit & take care of him for a while. Praying for God to send a better job your way. I pray you know & feel Jesus around you at all times Pray to Him & He will bring relief in His perfect timing. Wishing I could give you a big hug. Thank you so much for sharing this verse today. What an encouragement! Blessings! Thanks for this encouragement today Holley. May He continue to bless you as you bless others! Thanks Holley! I am now reading your post. I had a pretty stressful day at work. I had a bad start of the day with my cousin yelling at me. I have bible study tonight and I needed to unwind before going to church. I decided to go to Second cup café and have a moccachino and relax while reading. It’s just what I needed. My go to sometimes is a glass of wine. God said we would have trials & troubles in this world, but take heart for I have overcome the world. We shouldn’t run to various foods nor should we try to solve the problem on our own. Our first thought should be to pray about the situation. He wants us to come to Him. He will fight the fight for us. Girl, you don’t even know how timely this is for me. I read it yesterday and I read it again today. I may read it tomorrow and the next day too. I e-mailed it to my best friend because she knows this is right where I am. Thank you for being so spot on and thank you for sending it right into my email. I have been spinning my wheels for so very long with the main thought in my brain “what do I do?” on repeat, over and over, day after day. But it’s not my battle. and even though I know this in my brain, I don’t always feel it in my spirit. Trying to do it all, make everything better in my own power. And I have no power. so either nothing, or nothing substantial gets done. I have to open the door to my spirit and let the Lord and His armies come in and clean it out. spiritually and physically. Thank you for this wonderful and uplifting post! I love your last paragraph: “The same is true for whatever you’re facing too. I needed to read this today. Been trying to contact and help someone I care about but I’ve been blocked all the way. I am giving this problem to God and will leave it alone until He tells me otherwise. Your words, “You surround us with Your Love. You will take care of us” are true and a blessing to read. Thank you so much! Glory and power be to you, oh God! I pray that everyone on this site receive God’s blessings and help; for He alone is Lord. 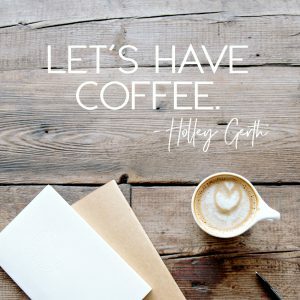 Just reading those battle-cry statements near the end of your post, Holley, made me sit up straighter: “I am a beloved daughter of God. I am more than a conqueror. Nothing is too difficult for me because nothing is impossible for the God within me. He will do it.” Hallelujah! Lots of power behind those scripture-words. (Think I’ll start a page in my quiet time notebook for these and any additional battle cries from the Bible I “happen” upon.) Strength for the Struggle! Thank you, Holley. No one escapes life’s storms. Some seek the shelter of Christ’s love, while others refuse it. The one’s who lean-in on Christ through the tough times are the ones who are able to endure and overcome. Noah sought out God’s refuge through obedience. He built an ark. Some labeled Noah insane. There was no rain. Noah believed in God and he obeyed the Lord’s command to build a boat, regardless of what the world said. Noah’s shelter was established through faith. Paul took shelter in Christ’s love while facing persecution and enduring physical torture. Paul’s strength stemmed from Christ’s love. Whatever your circumstance, seek the shelter of Christ’s enduring love. Take the route of faith. Be obedient to God’s will. Reside in the shelter of His peace by trusting in His plans.